This entry was posted on April 16, 2019 by Sew Essential. 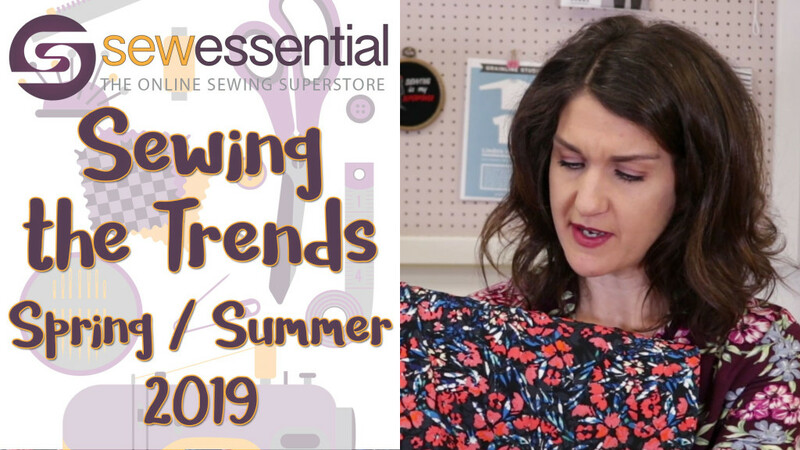 Hi and welcome to the Sew Essential vlog I’m here today to share some ideas based on the Spring/Summer trends for 2019. For the last few years I’ve done this as a blog post each season but I thought it would be nice to try it as a video this time. As always I’ve looked at the catwalk trends and how they’ve translated into wearable high street fashions so there’s nothing too crazy in here! I’ve also tried to pick pieces that will work together and can be mixed and matched to create a capsule wardrobe for the new season. As always the patterns and fabrics I mention are available on our site and the link to our site is below and if you like what you see please like and subscribe. So first off I thought I’d start with some separates in the form of trousers and tops perfect for the British spring/summer weather when, let’s face it, no one ever really knows what is going to happen! Once again culottes were everywhere. In terms of the fabrics I saw bold prints, bold block colours and neutrals worn with simple Tshirts, camis or vests. I thought these bright green culottes from Whistles were rather delightful and would look great paired with a simple cami or Tshirt. The vest on the Whistles image is certainly very figure skimming so if that’s not your bag I’ve suggested some nice alternatives that would probably feel less like you’re outside in your underwear. The pattern I chose for the trousers is the Emerson trousers by True Bias. There are options for a mid rise or high rise waistband, all views have pockets and are a pull on trouser with a flattering front waistband and pleats and an elasticised back. Comfortable and easy to sew I thought these could be a real wardrobe winner. I think they'd work well in our Coast linen look fabric, which you would need to line, or perhaps one of our denims or stretch cottons. The Emerson pants look fab paired with the Odgen cami by True Bias as in the image. I would use our mystique satin backed crepe or Prestige crepe fabric for the Ogden. If you'd rather cover your arms with a short sleeve, a plain T shirt such as the Lark by Grainline Studios would be ideal. I've just made my first version of this pattern and it is a very easy sew and comes together in no time. It works very well in our Cadiz cotton jersey fabric available in a wide range of colours. Paperbag waist trousers and shorts were incredibly popular last year and they're back again this year. The good news is they are also a nice easy sew. I spotted these bright yellow paperbag waist trousers on Boden and thought they were a nice alternative to the culottes if you prefer a more tapered leg, but still want to look on trend. McCalls 7726 has a few options including shorts and waist pleats rather than a paper bag. For the Boden look I would go for view C and lengthen the legs or view B and taper them more and use the paperbag waist instead of the pleats. Our Marmaris stretch cotton available in a range of colours would be ideal for these trousers and I would be tempted to go for a nice bright red. Although simple Tshirts and camis seem to be reigning in the fashion stakes there is still a sprinkling of pretty blouses out there, which can also be paired with culottes or paperbag trousers for an up to date look. I loved this pretty flutter sleeve blouse from Warehouse worn with paperbag shorts on their site. I thought our Jalie patterns Adele flutter sleeve top would be a great option to recreate something similar. It has sleeve options and an option for a tie at the front, which was another trend I spotted on shirts, blouses, dresses and jumpsuits. Our viscose evening roost fabric would be the perfect partner, keeping you nice and cool, worn with a neutral version of either of the trousers I've suggested. Another trend that looks like it is here to stay is the beloved jumpsuit. Thanks to it's popularity I saw a wide range of trends here including bold, bright prints, paired down utility chic and cropped versions. This jumpsuit from Warehouse jumped out at me (pardon the pun!) The bold print and wide leg created such a striking and modern look. I thought McCalls 7756 view A would be a great way to get the look in our floral purple and turquoise jersey fabric for a super comfy wear with all the wow factor. The midi length is still the Queen of the dresses and skirts this season. Midi length wrap dresses and shirt dresses were very prominent styles and are nice and easy to wear too. I thought this midi length floral wrap dress from Silk Fred would be a firm favourite in my wardrobe for evenings out or special events. Pair down the sleeves and skirt and it could be a wearable every day dress too. I thought the Eve Sew Over It dress pattern was perfect for this style. There are options for flutter sleeves and sensible sleeves, a hi lo midi length hem or a knee length straight skirt. I think it would work brilliantly in our viscose floral fabric teamed with a leather jacket and ankle boots for an on trend look or strappy shoes or court shoes if that's more your style. Other fabric trends I spotted included animal print, beige and sequins. I've just made a simple mini skirt with this lovely animal print scuba and can't wait to share it with you paired with my Lark T as featured in this video. We also have plenty of beige fabrics to choose from too - check out our plain woven and jersey fabrics to find your perfect shade. We also have a lovely range of sequin fabrics including this gorgeous ivory one, which I have earmarked for a Scout T by Grainline Studios. I hope you've all enjoyed my musings, I certainly feel full of enthusiasm and raring to go. Thanks for watching as always if you like what you see please like and subscribe and I'll see you next time.